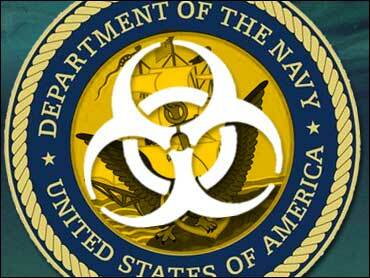 The Pentagon is continuing to withhold documents on Cold War chemical and biological weapons tests that used unsuspecting sailors as "human samplers" after telling Congress it had released all medically relevant information. In response to questions from The Associated Press about a deposition last month by a former military scientist, J. Clifton Spendlove, who planned and supervised the testing program, the Defense Department acknowledged this week it still has documents laying out the scope and methods of the tests. Detailed planning documents and reports for each of the tests are classified because they identify vulnerabilities of military vessels to chemical and biological warfare agents and capabilities for delivering the agents, the Pentagon said in a response to questions from the AP. In some cases, samples were taken from sailors to measure their exposure to tracers used to simulate chemical and biological agents, the Pentagon's written statement said. Reports on them were not released because they "did not include any plans or data that measured human effects," according to the statement. Project 112 and the Shipboard Hazard and Defense Project consisted of 50 tests conducted between 1962 and 1973. The tests were conducted in Alaska, Maryland, Florida, Georgia, Hawaii, Utah, Panama, Canada and Britain and aboard ships in the North Atlantic and Pacific oceans. CBS News Correspondent Vince Gonzales first reported in May 2000 on the more than 100 secret tests, some of which bore names like Autumn Gold, Copper Head, Flower Drum or Fearless Johnny. The secretive tests involved 5,842 soldiers and sailors — many of whom were unwitting guinea pigs. The experiments were designed to determine the effectiveness of biological and chemical agents in combat and methods to protect troops from attacks. An untold number of civilians also may have been exposed during some of the tests on the troops. In most cases, supposedly harmless simulants were used to mimic anthrax, E. coli or other agents, although in a number of cases potentially deadly nerve agents were used, including sarin and VX. Numerous veterans say they are now suffering from illnesses because of exposure, but the Veterans Affairs Administration has denied requests for health care coverage. After a three-year investigation that Pentagon officials characterized as "exhaustive," the Defense Department released an overview of the tests and a series of fact sheets last June and then disbanded the probe. But the overview and fact sheets didn't acknowledge the documents and films that were obtained by the plaintiffs and authenticated by Spendlove, including results of tests to determine how much of the chemical simulants the "human samplers" were exposed to. The Pentagon had already issued its first set of findings before it contacted Spendlove, who planned the Project 112 tests from the Deseret Test Center in Dugway, Utah. Spendlove, in sworn testimony in a federal court lawsuit in Washington on behalf of the veterans, said sailors were used in the tests as "human samplers" and cited several documents and films laying out the scope and methods of the tests. During his deposition, Spendlove was shown reports and films from a few of the tests that were obtained by the plaintiffs. He identified ships and individuals and vouched for their authenticity and indicated many more documents are likely stored at the library at the Deseret center where the testing program was headquartered. In one of the plaintiffs' films, a soldier is loading the orange-tinted simulant used to mimic anthrax or other biological agents into a plane that would spray it on a boat. He is not wearing any protective equipment and is caked with the substance. Spendlove's account was corroborated by Norman LaChapelle, a top Navy officer on the project, in an interview this week with the AP. But LaChapelle, a retired Navy commander who is now in charge of chemical and biological weapons response for the city of Memphis, said he was never contacted by the Pentagon in its investigation. "(Darn) right I was surprised" at not being contacted, said LaChapelle, who was in charge of the execution of the SHAD tests from 1964-1970. "We were involved in it. We weren't sitting in Salt Lake City. We were sitting at the test site." The Vietnam Veterans of America is suing Pentagon officials on behalf of the sailors, demanding the release of all of the test documents so the National Academies of Science can fully analyze the potential health effects. Douglas Rosinski, an attorney working with the veterans group on behalf of the soldiers, said the effects of the chemicals on the sailors has not been studied. The levels of exposure that the documents might detail is a crucial piece of the puzzle, he said. Rep. Mike Thompson, D-Calif., was frustrated by the revelation that the Pentagon is still unwilling to share information about the tests with the exposed sailors. "It doesn't sit with me at all," said Thompson, one of several lawmakers who pressured the Pentagon into admitting the existence of Project 112 after 30 years of denials. "I was under the impression that these guys had unearthed everything that was out there that was available and they'd done the work they were charged with doing. If what (Spendlove) says is true, they haven't done the work." The United States scrapped its biological weapons program in the late 1960s and agreed in a 1997 treaty to destroy all its chemical weapons. But according to an October 2003 report by the General Accounting Office, 1990, the U.S. has destroyed only 26 percent of its 31,500-ton stockpile of chemical agents.